Kilkenny had very little to spare over Offaly today. The midlands men put it up the Kilkenny from the throw-in and there was nothing in it heading in to the closing minutes of the game, but Walter Walsh's last minute point helped seal another win for Brian Cody's charges. Kilkenny now face either Galway or Wexford in the League Semi-Final. 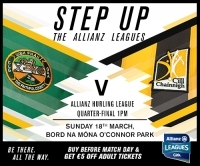 Kilkenny will face Offaly in the Allianz League Quarter-Final has been refixed on Monday in Bord na Mona O'Connor Park, Tullamore at 1.30. 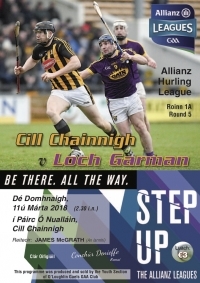 Kilkenny have finished strongly in the league and this game gives the winner the chance to face either Wexford or Galway in a semi-final, the following weekend. Tickets are available from most local Supervalu and Centra stores, and we stongly encourage supporters to pre-purchase their tickets. Click for below for tickets and parking information. Please note the time change from 1pm to 1.30pm. The Kilkenny team that will line-out on Sunday in O'Connor Park, Tullamore to face Offaly in the Allianz League Quarter-Final has been named. Click for full details. Kilkenny claimed all two points in Nowlan Park on Sunday, with a three point victory over Wexford. The victory leaves Kilkenny sitting in second place in Group 1A and facing a League Quarter-Final against Offaly next weekend. The Kilkenny team to face Wexford this Sunday has just been announced. Click for full details.